As a Kindergarten teacher, I feel compelled to occasionally buy treats for my students. It’s a complicated matter when one is living a zero waste lifestyle at home. So, I learned how to cheat. There is a big, famous grocery store with a massive bulk selection, but on their website it clearly states bringing your own containers is prohibited. I wanted to be respectful of their policy so I stopped shopping there. The grocer that does allow my own bags has a good, yet somewhat small bulk section. 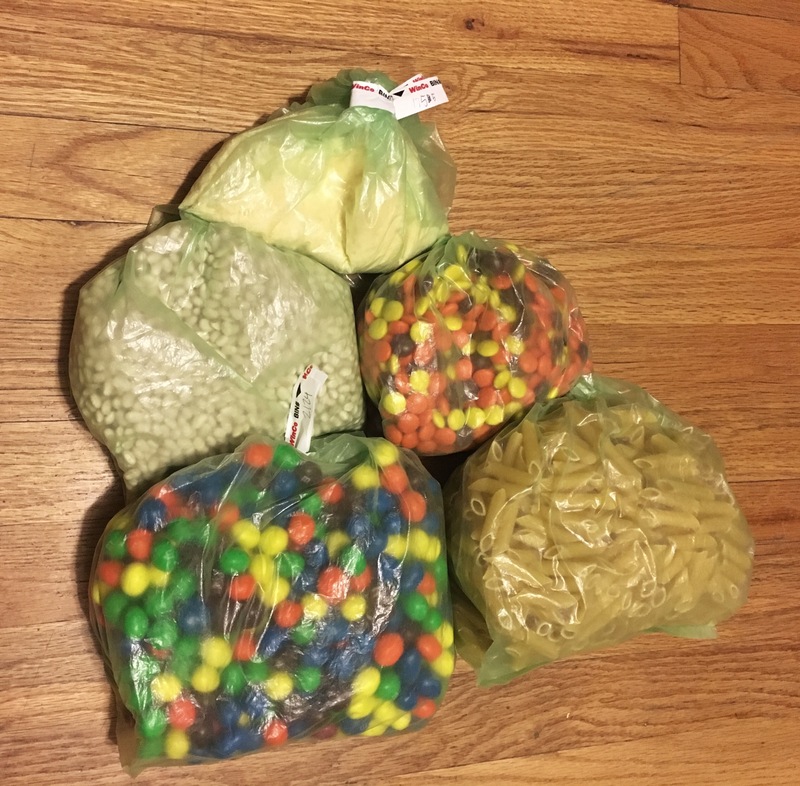 I made the mistake of purchasing jelly beans for my students and ended up spending $26 on about 2 pounds! Yikes! What to do? I decided to bring in some of these sturdy green produce bags (yes, plastic) that were a gift from my husband. I filled up on peanut M & M’s and Reese’s Pieces for my students. I also got a couple items I haven’t found elsewhere in bulk such as penne and Parmesan cheese. This entire purchase was coincidentally about $26. Ha! Don’t be fooled; that bag of chocolate is HUGE! Sorry for the crummy photo. So shhhhhh, don’t tell WinCo I cheated, because their prices are ridiculously low and I might be going back soon. The trash created was the twist ties and I considered bringing in my own string, but in the end decided I wanted to appear less conspicuous in case there were some rule enforcers snooping about.